Finley is a very happy and intelligent 8 month old Goldendoodle. However he had a tendency to bark and try to bite anyone he didn’t know. As a result, his owners contacted me for Goldendoodle training in Westchester NY. Finley was protective over his home, as well as the office he would normally go to on a daily basis with his owner. This was very stressful for his owners, and out of necessity, he was no longer able to go to the office that he loved. I am very pleased with the amazing transformation Finley made in such a short amount of time. 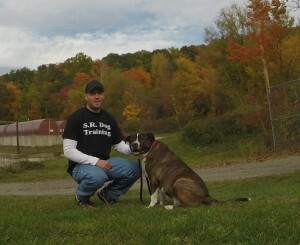 This is a testament to his dedicated owners implementing proper training. 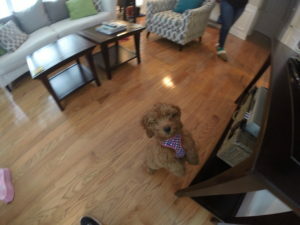 Here is what Finley’s owners had to say about our Goldendoodle Training in Westchester NY. “I called Steve when our eight-month-old puppy, Finley was barking viciously and biting anyone who entered our house. Our family was ready to give the puppy away. Steve came to the rescue! He taught us the skills to manage his behavior as well as guide us to the best ways to handle each and every situation. After only 2 weeks, we saw marked improvements and our out of control puppy was becoming manageable and less aggressive. Finley’s success story just proves that regardless of your dog’s behavior problems, age, or breed, we can make amazing progress by using sound dog training principles. Here is a short clip of my training clip of Goldendoodle Training in Westchester NY, with Sadie, a 13 week old Goldendoodle Puppy. Ralphie is a young-adult Goldendoodle, whose owner contacted me for Goldendoodle training in Westchester NY. Ralphie’s owner needed help with leash walking, obedience training, and overall high energy. The above video is a short clip of the amazing progress Ralphie has made with his Goldendoodle training in Westchester NY and the below clip is the success his owner ha made with a structured game of tug. 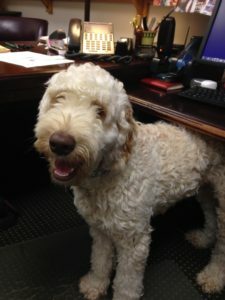 Ralphie is a young-adult Goldendoodle, whose owner contacted me for Goldendoodle training in Westchester NY. Ralphie’s owner needed help with leash walking, obedience training, and overall high energy. The above video is a short clip of the amazing progress Ralphie has made with a structured game of tug and obedience training. Bella’s family was struggling with housebreaking issues, that were leaving them frustrated and constantly cleaning up housebreaking accidents. This is VERY common for puppy owners, so the first thing we addressed was the very effective housebreaking approach I use with every puppy training client.